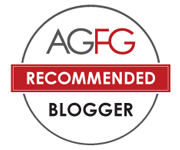 Is South Australia the food capital of Australia? Somebody asked me several weeks ago. Certainly I am not able to answer a simple “yes or no”, but what do know is that we have restaurants with different cuisines, which is a part of Australia’s multiculturalism. 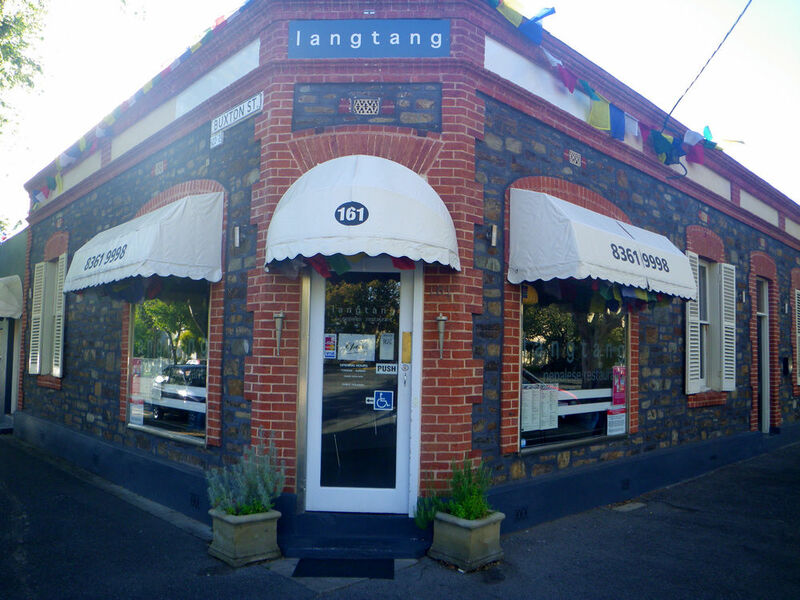 On Thursday last week, courtesy of the head chef, Tina and I ventured to langtang Nepalese restaurant, located on Jeffcott street in Adelaide’s historical and picturous precinct, North Adelaide. 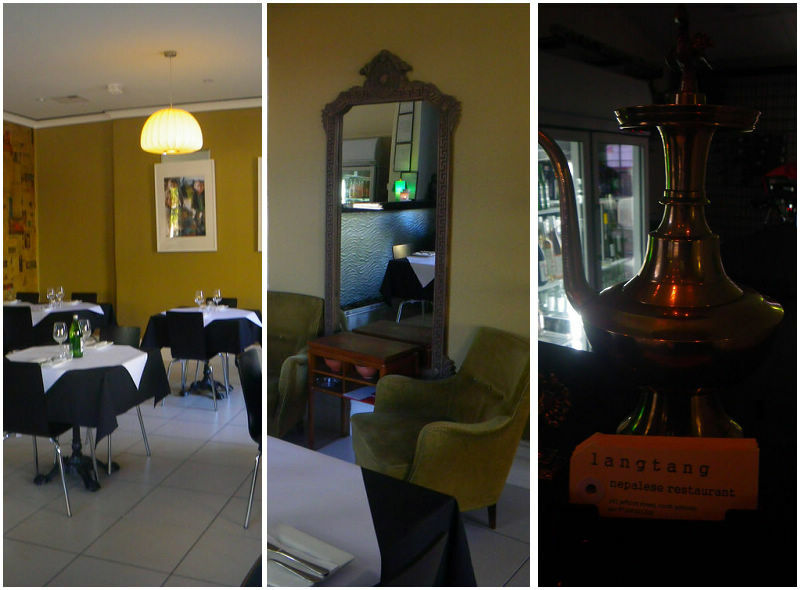 Langtang was opened in December 2012 and is operated by Chef Jagadish Ghimire and his wife. The decor was modern with a twist of Nepalese fusion. I did like the ancient feeling of the teapot :D. When entered the restaurant, we were greeted with smiles from the Mrs and the waitress. The restaurant was filled with clam and relaxing Buddhist musics, which sound familiar to me and Tina. We are never religious although we’d love to know all the philosophies behind different religions. My mother-in-law, however, is a true believer of Buddha and that’s why this type of musics sound familiar. 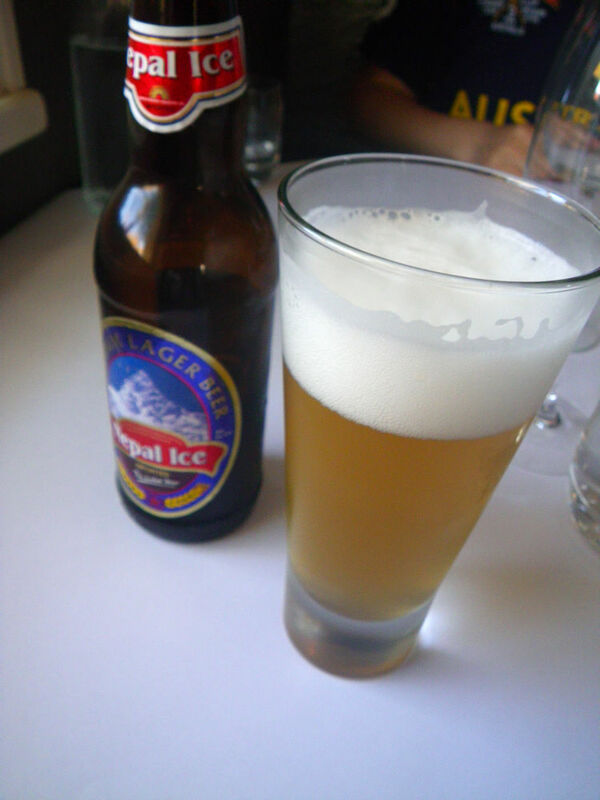 The restaurant offers a wide range of Nepalese dishes from entrees to deserts and an extensive wine menu, from which I decided to order a specialty Nepalese beer, Nepal Ice, a lager beer made in Kathmandu. In fact, I loved the beer! One should definitely try something different, right? The lager was clean on the palate with a strong flavour of barley and a hint of sourness can be tasted but was never a problem since the dinner was mainly focused on spices and chilli, which all got balanced out with the beer. The beer classified itself as the nation’s pride in Nepal. While we were sipping with the beer and a glass of lemon lime bitters, Chef Jagadish came out and we had a wonderful conversation about his restaurant. Came here 6 years ago, Jagadish first studied cooking at Regency Tafe and his goal was to create a more authentic Nepalese restaurant. I kept that in mind as later on in the post, you will find the dishes served were quite different from some of the familiar faces in Nepalese restaurant. 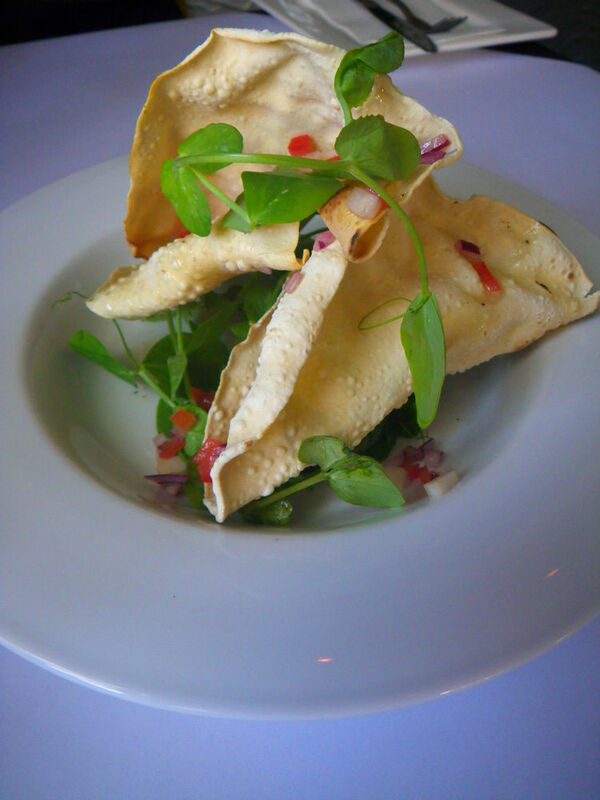 The first dish came out was a complementary starter with papadum with special Nepalese salad, which were crispy with a bit spices and refreshing. For the entrees, we asked for the tasting platter which contained four items from the entree menu, including a momo, choila, bara and sekuwa. I will explain the names in details below. Momo (Rightmost): Momos are Nepalese dumplings and the one we had on the night was chicken, which made up a really tender content inside. The topping sauce was a semi-hot Nepalese sauce, which left me with a long aroma after having the momo. One of the best momo I had in Adelaide. Cholia（Center)：Grilled beef pieces with Nepalese spices. The beef was grilled to perfection. Although it was full cooked, the texture in the mouth was not like boring braised beef. After mixed with the spices, extra flavours of star anise (somehow) and pepper were introduced into the meat. Well done! Sekuwa (Top left corner): Chargrilled lamb with Nepalese spices and yoghurt. This was my favorite among the four entrees. 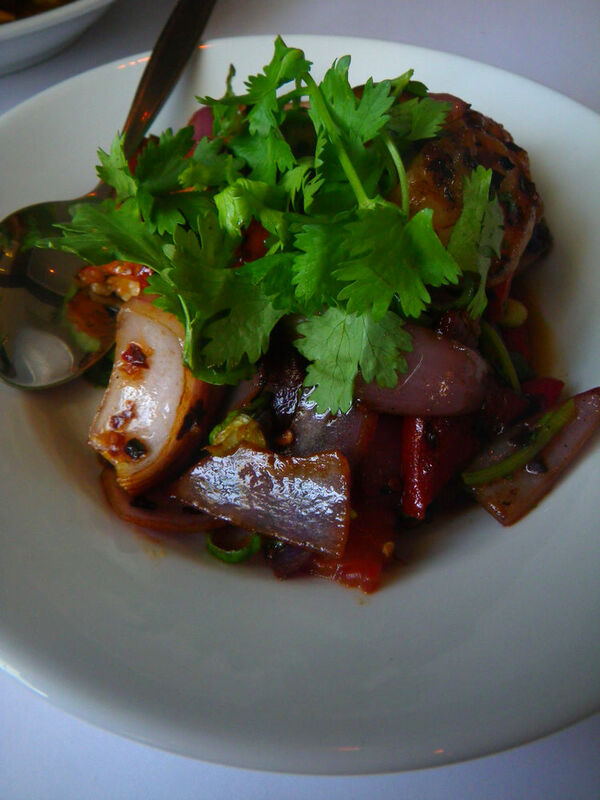 The lamb cubes were chargrilled to medium and coated with spicy and a slightly chilli flavour. The meat was super tender and left me with long lasting flavours and aromas. The owner said this entree dish can be requested to go much hotter, depending on customer preferences. 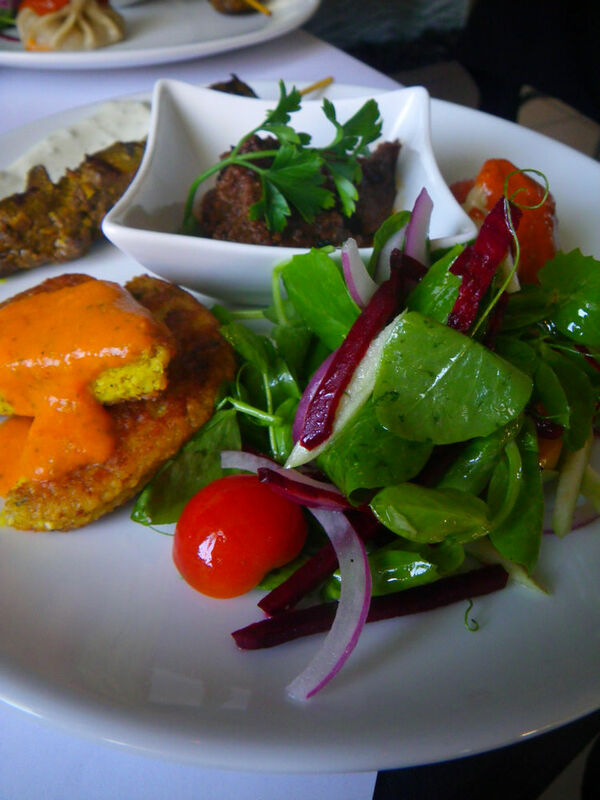 Bara (Leftmost): Black lentil patties served Nepalese style. This was a very good dish! The skins of black lentils were removed and the lentils were grounded to make the patties. The refined texture was smooth with only a little bit of roughness. 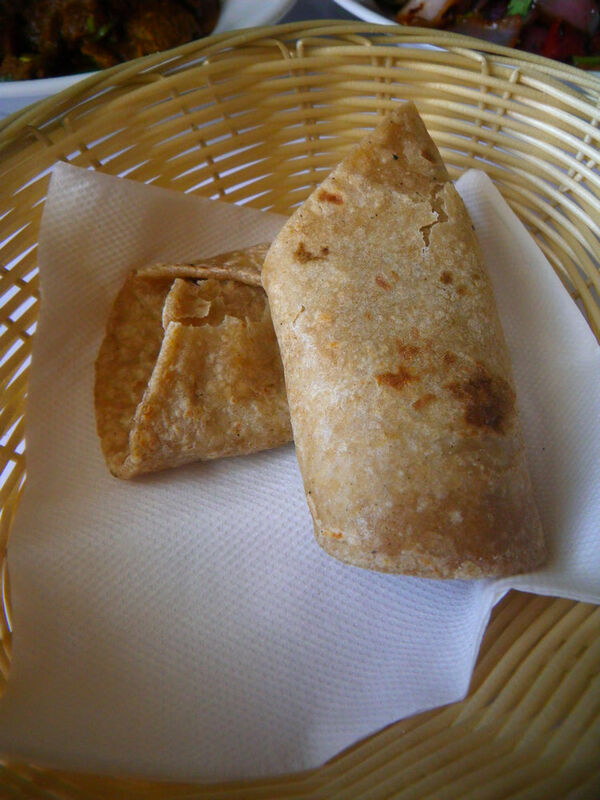 The flavour was quite fragrant especially with the Nepalese sauce, which tasted similar to the one for the momo. It was Tina’s favorite entree. After having the entrees, I was already semi-full and the mains came out quickly as well as two hot plates. We had three mains to share with a grilled vegetable dish, a bowl of rice and two roti on the side. I will talk about the dishes according to the order I tasted them. Remember these dishes are smaller than normal serve. We quite enjoyed all three mains and the side vegetable. 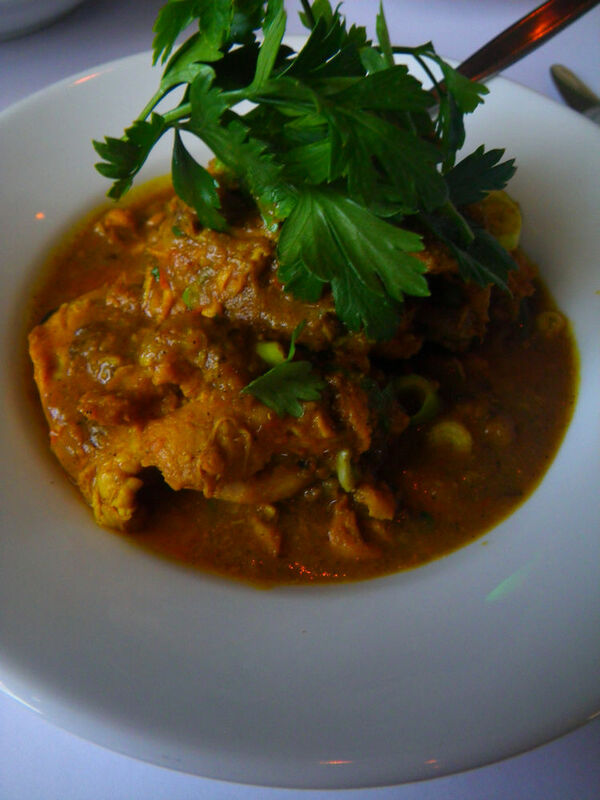 Timur Chicken, $18 – Nepalese style chicken curry served with a touch of Himalaya pepper sauce. The chicken pieces were cooked perfectly tender and went down into my stomach very quickly after each bite! The spices used were at a medium level but I believe you may be able to order hotter ones. The Himalaya pepper sauce was a magic touch to the dish as it enhanced the spiciness while still promoting the original chicken flavour! It is not butter chicken which I used to order at other Nepalese restaurant, but it tasted much better. Recommended. According to the manager, the ingredients used in these dishes are all local South Australian produce and their spices are sourced from a Nepalese grocery. By even tasting the chicken, the goat and the prawn, people can easily tell that they are made from fresh produce. Goat curry has become a dish whenever I go to a Nepalese restaurant and it truly never disappoint me, so does this dish. Tina doesn’t eat lamb and hence goat has always been a good alternative. 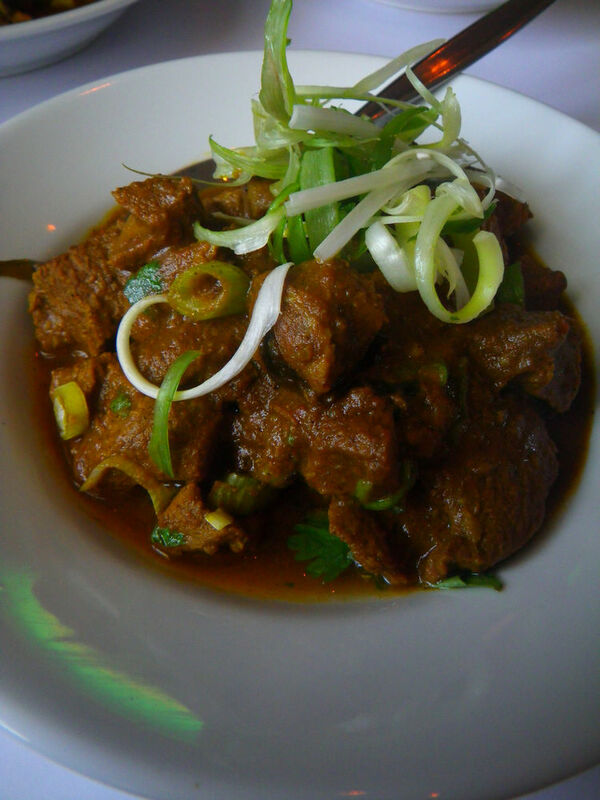 This goat curry was cooked with traditional method and was slow cooked to penetrate most of the flavours into the meat. The meat was so soft that even elder people can enjoy the meat. The spices was at moderate level but a hint of star anise and szechwan pepper was always pleasant to combine with the goat meat. According to the head chef, they used black szechwan pepper, which was deeper in flavour and hence made the dish tasted nicely. Oh, my dear readers! This dish was hoooooooooooooooooooootttttttt! I have to find a word to describe it as I love szechwan cuisine which is hot too. The very fresh prawns were cooked tender and the texture was absolutely beautiful while you can obtain most of the heat from the chilli. For this dish, I only had the prawns because I was not dare to touch the capsicum and hot chilli. LOL Recommended if you love hot and chilli dishes! The prawns went well with the rice and the roti, which may look, again, different to the roti we normally see in other restaurants. The side dish was with grilled vegetables, which I liked a lot. 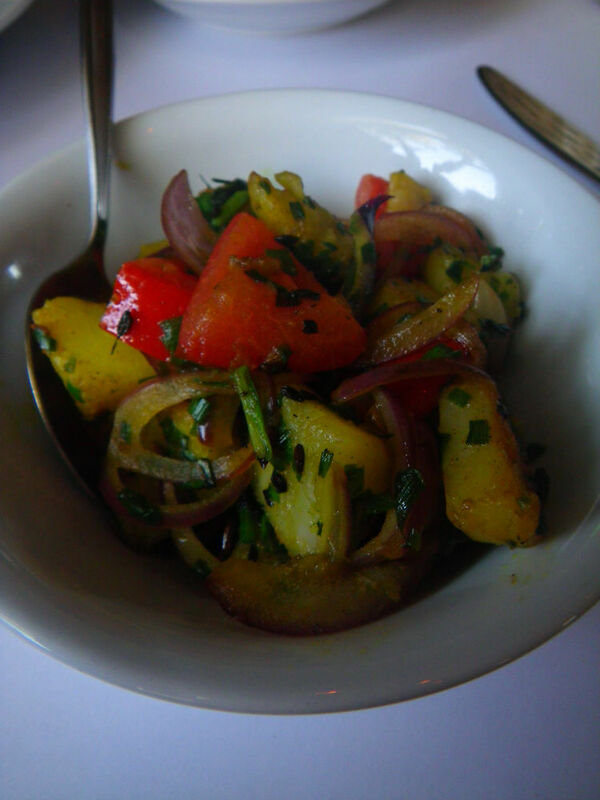 These vegetables gave a strong burnt earthy flavour and smell, in a good way, and complemented each and every dish. The price tag at the restaurant was reasonable and affordable, considering the size of the serves. After having the above dishes, Tina and I were extremely full and we walked from North Adelaide all the way back to the city. The service team was very efficient and helpful in deciding the dishes while I loved the Buddhist musics, which made the whole dining process pleasant and relaxing. The dishes served are quite unique and different from what we normally see as Nepalese cuisines. If you haven’t tried the place yet, why not give it a call and experience something different while you are at North Adelaide? So, readers, please let me know which is your favorite Nepalese restaurant in Adelaide? Damn that all looks tasty. I’m getting hungry!! Thanks for dropping by 😀 While I was writing last night, I got sooooooo hungry too :P.
On my list to try now! If you try it out, please let me know your thoughts as well. My favourite Nepalese has been Namaste in Norwood for quite a long time, but I’ve put this one down one my list to try. Terrific review. Thank you. I love Nepalese food! 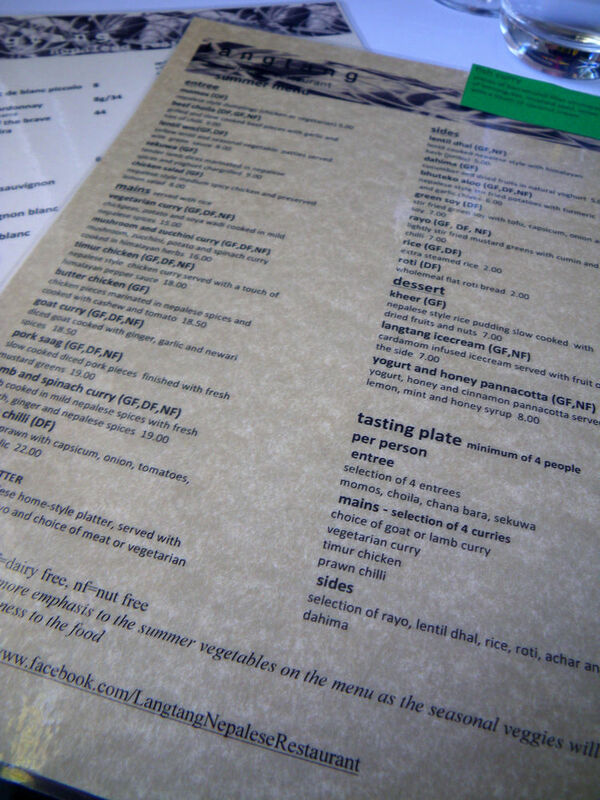 My favourite Nepalese restaurant is Taste of Nepal in Kensington, but I’m definitely up for trying somewhere new. Wow, glad to see you around. Taste of Nepal was the old site for Namaste many years ago, I think. How’s your study going? I’ve finished my degree and will be graduating in April! I was going to do Honours this year but had to withdraw due to some unforeseen circumstances, but hope to re-apply to do Honours again next year. So, I’m just relaxing this year and concentrating on making a few bucks to put aside for next year.